Last month, I went to a fairly hugemongous blogging conference. Besides getting to meet many blogging friends in real life, which was a lot of fun (read getting to see a bunch of middle age folks singing karaoke like no one was watching) the most valuable thing I got out of the conference was the session I did on SEO by Jessica Woodbury. The beauty of Jessica’s session was that it reaffirmed what I already knew about SEO for bloggers, and gave me clarity on how to apply it. The best thing she said? 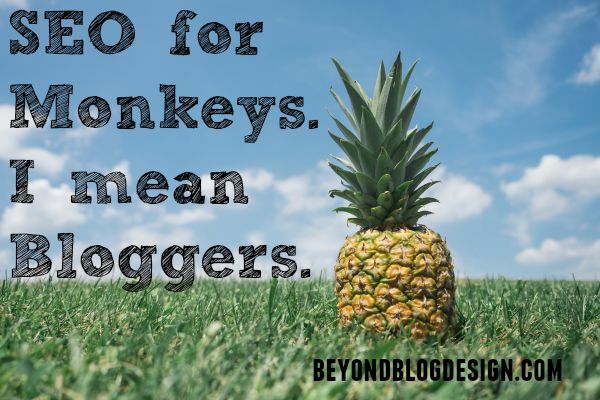 Bloggers are already doing SEO better than anyone else! So, what is the skinny? What do you need to know? The most important thing to know is write naturally. Google is constantly changing the way it reads sites. It’s little spiders are getting smarter and smarter. They know when you are trying to pull the wool over their eyes, and they are not going to like you for it. Try to make sure your keywords are in your title. I know, duh. But as a blogger, often times, we use pithy titles, metaphorical ones. We rarely say it like it is. So don’t worry! If you can’t put your keywords in your title, then you can, and should, do these next things instead. Update your permalinks. Caveat*never update permalinks that are already live! If you cannot put your keywords in your title, make sure to put them in your permalinks. For instructions how to do that seem my post on using Yoast SEO. Change your SEO title using the Yoast SEO plugin. If you can’t have your keywords in your title, and you want your post to rank higher, change the title that will show up in the Google search results by using the Yoast SEO plugin. This will NOT effect how your post looks on your blog. Make sure your word count is at least 600 words and contains your keywords. (I know you’re like, duh, try and keep me to 600 words) There’s a lot of info going around that says your post only needs 300 words to make Google happy, well times change, and those little word munchers are hungry. Unless you make your posts 600 words or more, they aren’t going to think you are yummy enough to feature on that first page. And don’t forget the reason they came! They want your keywords! It doesn’t have to be an exact match to make them happy, remember, write naturally, which means make sure your keywords happen organically, don’t force it! Do some Keyword Research. If you have never done keyword research before, this is probably the time to try. You may be more successful by using a variation of what you were thinking, but wouldn’t know it if you didn’t research it. I found the easiest way to do it was by using the Google Keyword Planner. Show Google you are the authority when it comes to this topic. Whether you are writing about divorced cats living in Tasmania, or famous rock bands of the fourth century, the way to tell Google that you are the Boss of This Topic is to use links. Links can come in a few forms. Links to other blogs and websites writing about the same content. Links within your blog back to posts that are about similar content. It’s all about the Bounce. Google doesn’t want to see people show up on your page and then leave right away. I’m pretty sure you don’t want that either. And it’s a multi-edged sword. Bounce tells Google that although you are trying to prove you are the authority on this matter, the people arriving on your site don’t think so. After a while, they’re gonna take the bouncers word for it. Make your site user-friendly, make sure that when a visitor arrives they know what to do the minute they get there. That if the post they land on isn’t the one they are looking for it’s easy for them to find something they will like. Make it easy for your readers to stick around, and it’s a win win for your site and your SEO. Try these tips and you’re guaranteed to see an increase in your search engine traffic! Let me know how it works for you, and if you’ve got a question, ask away! Wait a minute!!!! I’m working off of the 300 word rule. Oh geez :/ Thanks for the intel, Jen! You bet! She had some great tips, I can share more later if you like! Wish I knew this back when I started my first blog. What a great article. As an SEO textwriter I love these kind of handy lists to keep to the side. Still I like to write for the user / reader, but SEO is so much indemand and important, even regular novelists can do with handy tips like this. Thank you!